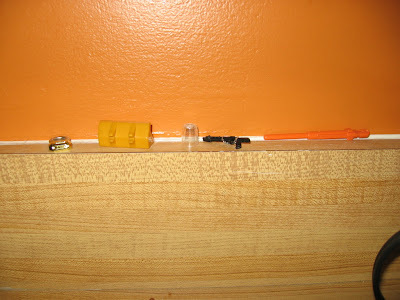 This is one of eight or nine "high-up" places in the house where we put the small items that Ann might choke on. 99% of these items are off of Greg's toys. In about two or three days we'll either re-attach or trash. Re-attach is code for looking at an item for a few seconds and then putting it in the trash. Though that Star Wars blaster might make the cut. That missile too. I always hated when those came up missing. Poor Greg. His toy parts taken away all because his little sister might die choking on it.